Corporate Awards - Denark Construction, Inc. In the past, Occupational Hazards Magazine listed Denark Construction as one of America’s Safest Companies. Denark was honored as one of seventeen very diverse companies chosen based on recommendations by industry professionals and recognition by industry associations. Denark shares this honor with national companies such as Bell Helicopter, Monsanto Company, and Texas Instruments Inc. The seventeen companies share a dedication to safe work and healthy workers. 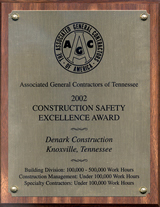 Denark received an award from the City of Knoxville for the completion of one million hours worked without a lost-time accident at the Knoxville Convention Center project, a record that brought the City $800,000 in insurance savings. Denark’s forces are dedicated to providing a safe workplace and striving to prevent accidents on each and every construction project. This is further evidenced by Denark’s national recognition for being the “best of the best” in safety excellence. After successfully competing at the state level, Denark has competed nationally and proudly accepted the Grand Award for Construction Safety Excellence from the Associated General Contractors of America (AGC). The Grand Award for exceptional safety performance is judged against the thirteen first place winners in all categories at the convention and represents the “best of the best” in construction safety excellence. Denark won the Grand Award because of our safety processes, management involvement, and company safety culture. This achievement is a result of Denark’s strict adherence to one of our core missions: insisting on safety and quality in every aspect of our work. To be named nationally as the “best of the best” in safety excellence is a true testament of the commitment of Denark’s team. Denark is honored to have been recognized by the Associated General Contractors (AGC) and the Associated Builders & Contractors, Inc. (ABC) for Construction Excellence. Denark was awarded the second annual prestigious East Tennessee Business Ethics Award based on the following criteria: executive commitment to business ethics, an ongoing ethics program, ethical business practices, and good corporate citizenship. 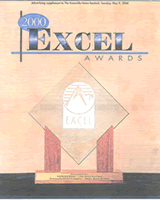 Denark has been honored by its selection as an Excel Award Winner – distinguishing it as one of the twenty-five fastest growing firms in East Tennessee. 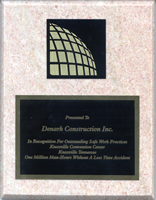 This Award, sponsored by The Knoxville News-Sentinel, AmSouth Bank and Pricewaterhouse-Coopers LLP, was given to Denark Construction for fiscal years 1996, 1997, 1998, and 2000. Denark Construction was named as Best General Contractor in the Metro Pulse Best of Knoxville 2013 Winners.